Background: Branded drugs are usually considered as the most reputed for their safety and efficacy among health-care providers and patients rather than the cheaper branded-generic counterparts. Lacking confidence in generic drugs may lead to patient's nonadherence and treatment failure. Aims: To building up the confidence in some branded-generic drugs by evaluating their quality patient cost versus their branded counterparts. and Methods: Two groups of commonly used anti-diabetic drugs including glibenclamide and metformin, respectively, were selected. Each individual group contains three generics and one reputed international branded tablets were evaluated for their quality and patient cost effect. Quantitative and qualitative examinations were conducted following the USP and BP specifications. The obtained results were statistically analyzed using analysis of variance. Results: All qualitative and quantitative pharmacopeial tests, including each respective tablets weight uniformity, tablets friability, tablets hardness, disintegration time, dissolution tests, individual drug identification test, chemical composition, and drug content uniformity, were within their pharmacopeial specifications with no statistically significant difference between the generics and the branded tablets (P = >0.152–0.255). 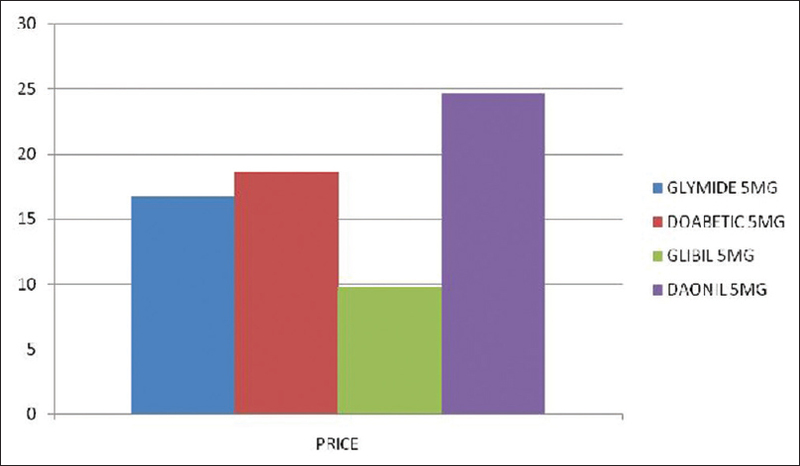 The margin of patient cost price for the generic tablets were between 15% and 27%, 6% and 42% for the metformin and daonil groups, respectively, and the margin of the price-to-patient for the lowest price and the highest price of the generic tablets were higher in the range between 50–65% and 25–63% when compared to their respective reputed brands. Conclusions: Pharmacopeial examinations showed that generic tablets are quantitatively and qualitatively equivalent to their internationally reputed brands within the tested tablet groups with the advantage for the generic drugs being significantly the cheapest. Patient compliance and adherence to their prescribed medications are major factors that contribute to better treatment outcomes. Most health-care providers are more reluctant on prescribing reputed international brand medications to their patients rather than their rather cheaper generic counterpart products. Many factors are related to those contests, including the huge marketing propaganda and high spending by the international drug innovative companies to promote their brand drugs. Furthermore, the majority of drug prescribers and most patients are psychologically oriented that expensive brand drugs are more trusted as safe and effective rather than the generic counterparts. Sometimes patients cannot find the prescribed brand drugs available in the market while their physicians still insisting on those brands, the way by which patients interrupt their treatments. On the other hand, if the physicians are more aware, and have the confidence to the generic competitors, they would have to convince their patients and raise their concerns for better adherence to the generic drugs. Despite the wide research investigations that provided positive data on generic drugs efficacy, yet, doubt still remains about whether the generic drug bioequivalence is identical to those counterpart brands. Furthermore, the patient perspective of generic drugs may also have an influence on drug adherence for successful therapy, and this might result in poor patient compliance or a cessation of therapy., In addition, many physicians consider that generic drugs are not as equivalent in quality and not as safe and effective as their brand drugs and this could be important barriers that hinder the use of generic substitutes. Positive response toward prescribing generic drugs have been initiated through the implementation of strict certifications drugs in addition to implementing drug price competition strategy., Different drug manufacturers were, therefore, aiming to adopt further studies on their generic drugs efficacy and bioequivalence  to improve the reputation of their products and be able to compete with their brand counterparts. The major concerns in this area are that the rate and extent of drug absorption might differ between the generic and the brand drugs which, in turn, affect their therapeutic bioavailability. Gastrointestinal (GIT) drug absorption is affected by the release of the drug from its dosage form. Drug dissolution test is considered as one of the major pharmacopeial drug quality control tests and adopted as an effective parameter to predict drug release, GIT absorption and consequent bioavailability from different pharmaceutical dosage forms; therefore, physiological GIT drug absorption can be assessed by its in vitro dissolution testings. The food and Drug Administration (FDA) has dictated that in order for the generic drugs to be approved, they have to pass many guided tests and examination for their physicochemical characteristics, contain the same active constituents and strength, in addition, to be bioequivalent to their brand innovative product. Patients with diabetes mellitus are expected to progressively increase up to 366 million by the year 2030, the way by which, heavy economic burden will be imposed on health-care authorities due to the increasing cost of the anti-diabetic drugs. Accordingly, there is a need to consider the less costly generic substitutes that are pharmaceutically and therapeutically equivalent to their concerned brand products. Glibenclamide and metformin are extensively adopted from the different classes of anti-diabetic drugs as being first-line therapy for the management of Type II diabetes mellitus and considered leading class of the prescribed anti-diabetics since 2004. On the other hand, the wide consumption of nonsteroidal anti-inflammatory drugs was in favor of the expensive and reputed branded form rather than that of their rather cheaper pharmaceutically equivalent generic products. The aim of this study was, therefore, to examine some randomly chosen widely used generic anti-diabetic drugs including glibenclamide and metformin and generic ibuprofen as example of the nonsteroidal drugs with respect to their pharmacopoeial specifications and the FDA guidelines for drug quality in comparison with their counterpart reputed brands. It is also aimed to implement confidence among physicians and patients that the tested generic drugs are as pharmacopoeially equivalent as their branded counterparts and conform to the FDA guidelines. This may encourage health-care drug prescribers to adopt the use of generic drugs with lower copayments for better patient adherence and consequent better therapeutic and pharmacoeconomic outcomes. A group of three randomly selected generic 5 mg/glibenclamide tablets and a second group of three generic 500 mg/metformin tablets and their corresponding counterpart brands, namely, daonil 5 mg/tablet and glucophage 500 mg/tablet, respectively, were purchased from the local community pharmacies in the capital of Riyadh City, Kingdom of Saudi Arabia. All the generics and their counterpart brands were within their shelf-lives and fulfill their required label specifications. The three generic tablets from the glibenclamide group were denoted as A1, B1, and C1; whereas, those belong to the metformin group as A2, B2, and C2. Each of the two groups was then compared with their corresponding brand tablets coded as D1 and D2, respectively. All tablets were examined visually and shown no manufacturing defects before subjecting them to the following tests. Identification of glibenclamide was performed according to the BP monograph via thin layer chromatography. The test was carried out by comparing the retention index (Rf values) for the standard glibenclamide solution chromatogram to that solution obtained from the extracted tablets of each tested sample. The test was performed by applying a solution representing the extract of either the generic or the brand tablets at concentration of0.5% glibenclamide, and a solution containing 0.5% of standard glibenclamide. The high-performance liquid chromatography (HPLC) system employed in this study consisted of an ultraviolet (UV)/detector, pump, and an integrator (Merck-Hitachi, Model L-7400, Tokyo, Japan). The employed HPLC column was C18, 5 μm, 200 × 4.6 mm i.d. (Thermo Scientific, USA). The mobile phase used was as per BP  recommendation and comprised a mixture of potassium dihydrogen orthophosphate buffer (at pH 3) and acetonitrile at a ratio of 53:47, respectively and with flow rate of 1.5 ml/min. The buffer was vacuum filtered through 0.2 μm cellulose acetate membrane and then mixed with acetonitrile. The mobile phase was degassed in an ultrasonic bath. The column was set at room temperature and equilibrated to a stable baseline before the start of injections. The flow rate was set at 1.5 ml/min and the sample injection volume was 20 μl and the analytical wavelength set at 300 nm. Accurately weighed 50 mg of pure standard glibenclamide transferred into 50 ml volumetric flask with 20 ml of methanol added, and the mixture was sonicated for 20 min and then made up to the 50 ml mark with methanol to obtain a final concentration of 1000 μg/ml stock solution. Serial dilutions were made from the 1000 μg/ml stock solution to obtain calibration concentrations of 50 μg/ml, 100 μg/ml, 150 μg/ml, 200 μg/ml, 250 μg/ml, and 300 μg/ml. For each product, twenty tablets were accurately weighed and powdered and the equivalent of the average weight of one tablet (5 mg) was transferred to a 20 ml volumetric flask. A volume of 2 ml of distilled water was added and the volume was adjusted to mark with methanol. The mixture was sonicated and filtered through a 0.45 μm millipore filter from a syringe. Three separate preparations were made for each generic and brand product, and each preparation was run in triplicate along with three injections of the standard glibenclamide solution. The percentage of glibenclamide content was then calculated for each sample using the standard calibration curve. Ten tablets from each individual glibenclamide sample were taken, and each tablet was assayed individually as per the pharmacopeial monograph. Individual tablets were introduced in 50 mL volumetric flasks with 1 mL of distilled water and the flasks were shaken to disintegrate the tablets. A volume of 10 mL of ethanol was added in each flask and was shaken mechanically for 30 min. The volume of each flask was adjusted to 50 mL with. Aliquot of each flask was centrifuged at about 4000 rpm, and then 20 μL of the clear supernatant was injected to the chromatograph as per the procedure under glibenclamide assay. Ten tablets from each individual metformin sample were taken, and each tablet was assayed individually as per the pharmacopeial monograph. Each single individual tablet was introduced in 100 mL measuring flask and shaken with the aid of about 50 mL phosphate buffer (pH 7.4) to dissolve the active drug. The volume of each flask was the adjusted to 100 mL with the buffer, mixed, and centrifuged. Subsequent diluted samples were measured for their absorbance using UV spectrophotometer at wavelength of 232 nm. The concentration of each sample was determined from a calibration curve as mentioned under the assay of metformin/tablet. Twenty tablets from each of the three generic metformin samples and twenty tablets from the corresponding metformin brand were randomly selected and individually crushed and pulverized into powders. An equivalent of 100 mg of the metformin from each powdered sample were weighed and dissolved in 100 ml distilled water. The metformin content/tablet from each generic sample and their corresponding brand sample solutions were determined by measuring UV absorption after being diluted against the blank at 232 nm using an UV spectrophotometer (Shimadzu UV-1800, Japan). The ratio of drug content in samples compared to standard was calculated as percentage for each generic and branded tablet. The USP 34 dissolution procedure was adopted to perform the in vitro drug release from the different glibenclamide samples. The USP apparatus two paddle was used at 50 rpm. The dissolution media used were either phosphate buffer at pH 7.4 or borate buffer pH 9.5 (selected in accordance with the USP monograph, maintained at 37 ± 0.5°C. Six tablets from each generic and brand sample were tested. The amount of glibenclamide released from each tablet in the tested samples was determined by the HPLC method mentioned above (refer to assay of glibenclamide content). The dissolution rates taken as percentage of drug released for the generic tablets were compared with their brand sample at the stated pH values. Six serial diluted solutions of standard metformin were prepared with concentration between 0.3125 μg/ml and 10 μg/ml were prepared from a stock solution and standard curve was drawn. The curve was linear with a correlation coefficient of 0.9994. The dissolution test was performed using USP  apparatus II (Erweka DT6R) with steering rate of 100 rpm and 37°C on six tablets of each of the generic and the brand tablets. The dissolution medium was 900 ml of phosphate buffer at pH = 7.4. 5 ml aliquot from the dissolution samples were taken at different time intervals for up to 60 min and replaced with the equal volume of fresh dissolution medium. Subsequent diluted samples were measured for their absorbance using UV spectrophotometer at wavelength of 232 nm. The concentration of each sample was determined from a calibration curve. All tested samples conformed to the USP dissolution specification  for passing the test as no <80% of metformin released from all tablets within 30 min. The mean weight of twenty tablets from each individual generic and brand samples were calculated. The deviation of each single tablet from the mean weight together with the standard deviation was calculated for each sample. Tablet hardness was measured by placing each tablet between the anvils of the diametral compression tester. The force required to break each tested tablets into two clean halves was taken as the hardness or crushing strength. Twenty tablets were tested from each sample and their mean hardness calculated. The disintegration time from each generic and brand samples were measured for six tablets/sample as per the BP specification. The experiment was performed on three sets of 6 tablets each and the readings were taken for each sample and the mean was calculated. The results of friability data of all the tested glibenclamide and metformin tablets from the generic and branded tablets are presented in [Table 1]. All samples showed satisfactory friability values of <1%. [Table 1] includes the weight variation data of the generic and branded tablets. The uniformity of weight of all the samples was acceptable as none of the tablets deviated from the mean by more than 5%, thereby meeting the BP standard. Weight variability within each batch was also low as shown by the standard. High weight variation indicates varied amounts the active ingredients and/or other tablets additives. Variation of active drug may lead to ineffectiveness, toxicity, or unpredictable drug effect of the dosage form while the variability of additives may affect other physicochemical characteristics of the dosage forms and consequently may alter their drug bioavailability. Crushing strength (hardness) data of all tablets are presented in [Table 1] and showed values not <4 Kg (as a lower limit) and not more than 8 Kg/f (as an upper limit). Excessive tablet hardness would extend tablets disintegration time, and consequently, affect their drug dissolution and GIT absorption rates, bioavailability, and the onset of action. Soft tablets, on the other hand, are unable to withstand handling, storage, and transportation without breaking. The values of the content uniformity of glibenclamide and metformin from the generic and branded tables are shown in [Table 2]. The acceptance value was determined as per the USP 34. The acceptance values for all samples were between 90% and 110% and all conform to the pharmacopeial specifications. The results of disintegration test of all the tablets in [Table 1] show that all the samples were in agreement with BP standard of not >15 min. Pharmacopeial dissolution tests are a standard procedure used to ensure that the drug release in a sufficient therapeutic quantity from an oral dosage form for successful GIT absorption and consequent bioavailability. The release results after 1 h from the tested generic and branded glibenclamide tablets at pH 7.4 and pH 9.5 are included in [Table 3]. At pH 7.4, the release values for the generic tables A1, B1, and C1 were 62%, 55%, and 65%, respectively and that for the brand tablets D1was 57%. On the other hand, the results of glibenclamide released from the generic sample A1, B1, and C1 were 95%, 102%, and 99% and that for the branded sample was 97% at pH 9.5. It can be seen that the amount of drug released was much more pronounced at the higher pH value of 9.5. However, at any of the studied pHs, the glibenclamide release from both the generic and the brand tablets are comparable. The release results from the generic and the brand metformin sample at pH 6.8 phosphate buffer  were very close for this highly water soluble drug. The results were presented in the last column in [Table 3]. It was noted that the values of the drug released generics A2, B2, and C2 were 91%, 88% and 92% and 94% of drug release in 30 min. These results were in accordance with the pharmacopeial criterion  and showed similarity in predicting their bioavailability. 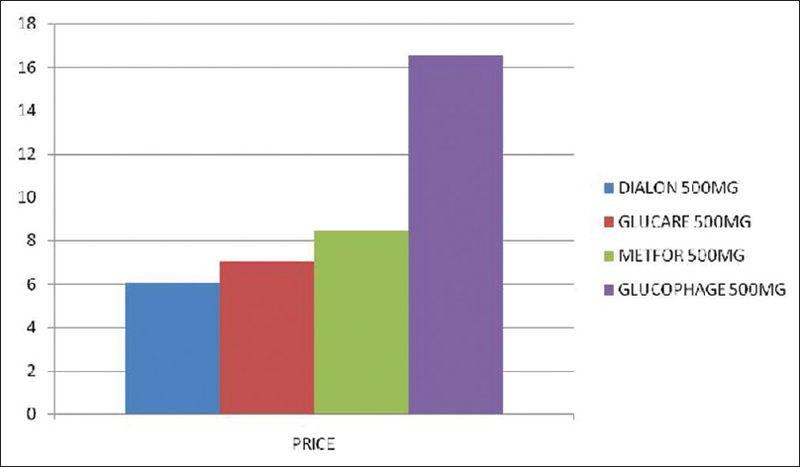 Concerning drug cost effectiveness, [Figure 1] and [Figure 2] are representative of the retail cost variations for the generics and brand glibenclamide tablets and those of the metformin tablets, respectively. It is clear from both figures that the retail prices for the generics were quite comparable and found considerably cheaper than their brand tablets and hence, better affordable by the patients who are not under health insurance. According to the obtained up mentioned results, we can conclude that generic drugs could be better substitutes from the rather more expensive brand products, especially both can afford similar quality and consequent therapeutic effect. Economically, the patient may be declined to afford the price of the rather expensive brand drugs, so that their adherence to continuing their treatment course may be interrupted and lead to serious health outcomes. Pharmaceutically, equivalent generic drugs are therefore worth a positive consideration by both the health-care drug prescribers for successful drug patient adherence and consequent treatment outcomes with an affordable retail price. Gagne JJ, Choudhry NK, Kesselheim AS, Polinski JM, Hutchins D, Matlin OS, et al. Comparative effectiveness of generic and brand-name statins on patient outcomes: A cohort study. Ann Intern Med 2014;161:400-7. Haas JS, Phillips KA, Gerstenberger EP, Seger AC. Potential savings from substituting generic drugs for brand-name drugs: Medical expenditure panel survey, 1997-2000. Ann Intern Med 2005;142:891-7. Holmes CB, Coggin W, Jamieson D, Mihm H, Granich R, Savio P, et al. Use of generic antiretroviral agents and cost savings in PEPFAR treatment programs. JAMA 2010;304:313-20. Helmers SL, Paradis PE, Manjunath R, Duh MS, Lafeuille MH, Latrémouille-Viau D, et al. Economic burden associated with the use of generic antiepileptic drugs in the United States. Epilepsy Behav 2010;18:437-44. Johnston A, Asmar R, Dahlöf B, Hill K, Jones DA, Jordan J, et al. Generic and therapeutic substitution: A viewpoint on achieving best practice in Europe. Br J Clin Pharmacol 2011;72:727-30. Fujii H, Iihara H, Yasuda K, Matsuura K, Takahashi T, Yoshida K, et al. Evaluation of efficacy and safety of generic levofolinate in patients who received colorectal cancer chemotherapy. Med Oncol 2011;28:488-93. Kalisch LM, Roughead EE, Gilbert AL. Brand substitution or multiple switches per patient? An analysis of pharmaceutical brand substitution in Australia. Pharmacoepidemiol Drug Saf 2008;17:620-5. Shrank WH, Cox ER, Fischer MA, Mehta J, Choudhry NK. Patients' perceptions of generic medications. Health Aff (Millwood) 2009;28:546-56. Shrank WH, Liberman JN, Fischer MA, Girdish C, Brennan TA, Choudhry NK. Physician perceptions about generic drugs. Ann Pharmacother 2011;45:31-8. Duerden MG, Hughes DA. Generic and therapeutic substitutions in the UK: Are they a good thing? Br J Clin Pharmacol 2010;70:335-41. Andersson K, Bergström G, Petzold MG, Carlsten A. Impact of a generic substitution reform on patients' and society's expenditure for pharmaceuticals. Health Policy 2007;81:376-84. Gilman JT, Alvarez LA, Duchowny M. Carbamazepine toxicity resulting from generic substitution. Neurology 1993;43:2696-7. Kesselheim AS, Misono AS, Lee JL, Stedman MR, Brookhart MA, Choudhry NK, et al. Clinical equivalence of generic and brand-name drugs used in cardiovascular disease: A systematic review and meta-analysis. JAMA 2008;300:2514-26. Shah HK. Generics capture new prescription market. Perspectives in Pharmacy Economics 1992;4:3. Alexander GC, Sehgal NL, Moloney RM, Stafford RS. National trends in treatment of type 2 diabetes mellitus, 1994-2007. Arch Intern Med 2008;168:2088-94. The British Pharmacopoeia Commission, British Pharmacopoeia. Vol. II. London: The Pharmaceutical Press; Her Majesty Stationary Office; 2007. The British Pharmacopoeia Commission, British Pharmacopoeia. Vol. I. London: The Pharmaceutical Press; Her Majesty Stationary Office; 2010. The United States Pharmacopeia, and National Formulary, USP 30-NF 25 25; Rockville MD: The United States Pharmacopeial Convention, Inc; 2007. The United States Pharmacopeia and National Formulary, USP 34–NF 29. Rockville, MD 20852-1790 USA, The United States Pharmacopeial Convention, Inc.; 2011. Fell JT, Newton JM. Determination of tablet strength by the diametral-compression test. J Pharm Sci 1970;59:688-91.